We didn’t fancy the overnight bus so we bit the bullet and took the 8 hour daytime bus. Lovely buses in Mexico. Smooth rides, careful drivers and on -board toilets. This ride, like others we have taken, was going really well until we pulled over to see what all the trucks were parked on the side of the road for….Teachers strike! So? I hear you say. Well, teachers here are a bit more gung ho than back home. This strike has been going on for some time. Like 4 years on and off! And frequently manifests itself in road blocks. They literally barricade the highways so anyone going into or out of Oaxaca .. isn’t. A while back things really got out of hand, the remnants of that debacle still rust on the side of the road where many were injured and several killed. Maybe the doctors ought to take note on the techniques back in Blighty. Our driver, unperturbed then set off down a dirt road, through a cornfield and maneuvered through tiny hamlets and over school playing fields rather than sit on the side of the road for who knows how many more hours. And thus, educated in teaching politics and hungry we arrived after an 11 hour journey. Boy was it worth it! Oaxaca is fantastic. 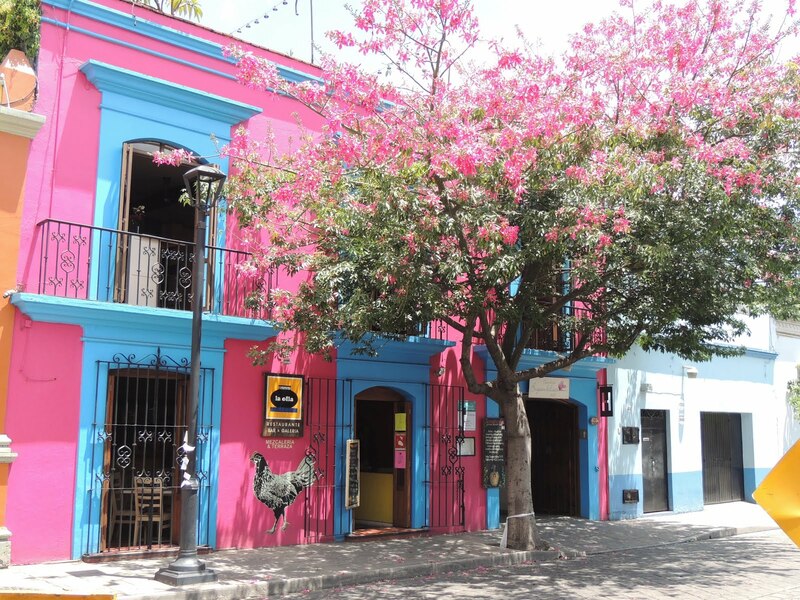 It's a large city but all of the good stuff happens in the old downtown area which has block after block of picturesque streets lined with colourful buildings. It’s really arty with free concerts and plays and events happening the whole time. Galleries, bars and cafes are full of appreciative punters and many of the roads are wide and quite impressive. 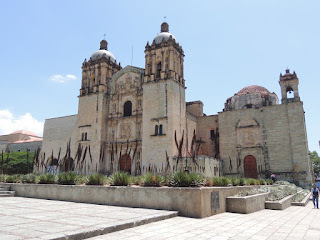 There is an amazing ornate basilica set in a pleasing square with an adjoining museum housed in the extensive buildings. A highlighlight being an encrusted skull which no doubt was the inspiration for Damien Hursts diamond facsimile centuries later. As well as this there are numerous other churches and stately buildings. And, as with many towns, its sits amongst surrounding green hills. Its far enough away from most tourist destinations that the gringo is rare but it has enough foreign residents that it feels cosmopolitan. We lodged in a noisy hostel for a couple of nights whilst we got our bearings but, once we discovered how great the place was, we moved to a much quieter little bedsit. Let me correct that. It would have been quiet but the night we arrived there was a party that we got invited to next door where we drank wine, mezcal and met lots of incredibly friendly people who invited us to a further party the next day. This welcoming crowd of twenty and thirty somethings drew us into their world of artists, filmmakers and all sorts of people who actively encouraged us to stay and enrich their lives (my words not theirs. But could read it in their eyes). Oaxaca, pronounced Wa hah ka, has very quickly jumped to being another prospect as a place to live. Not only for what is in the town but its proximity to a good outdoors life in the surrounding mountains and villages. 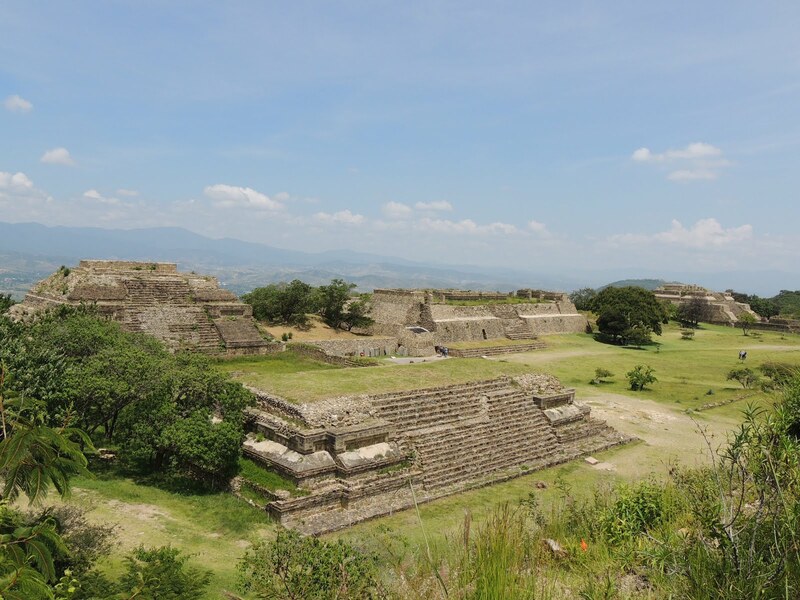 Monte Alban. Is a short jaunt up into the hills around the city and is the home of some great ruins. 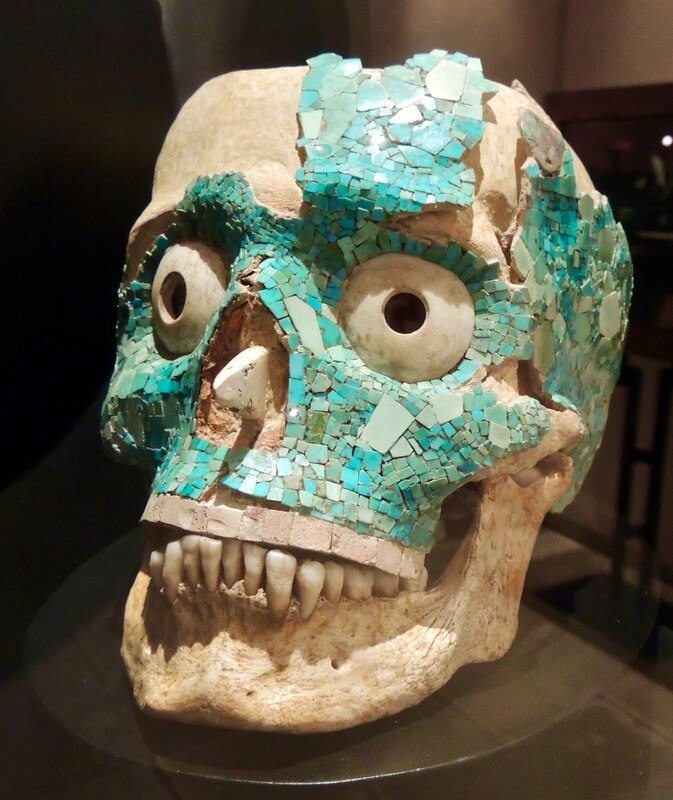 This was a site of some standing – inhabited by Olmecs, Zapotecs and Mixtecs over 1500 years, it was the chief ceremonial site of the area. Safely or, more importantly, visually perched on a steeply walled plateau with no water and no strategic use. The remains of temples and frescos are still in good condition and one really gets a sense of something when sitting on the rocks and feeling the wind blowing up from the lowlands. 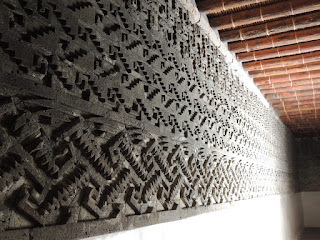 Another day we visited Mitla and Hierva del Agua. The first is another set of ruins set in the middle of a sleepy little village. These in themselves are not big and impressive but they do show off some startlingly complex geometric friezes. These clearly demonstrate the ability of the early stone masons who, with limited technology at their disposal, were still able to work to very small tolerances. From here we managed to get a ride up to the amazing geological spectacular that is Hierva del Agua. A petrified waterfall that is formed from limestone build up over many thousands of years and gives the impression of water pouring off the edge of a precipice. 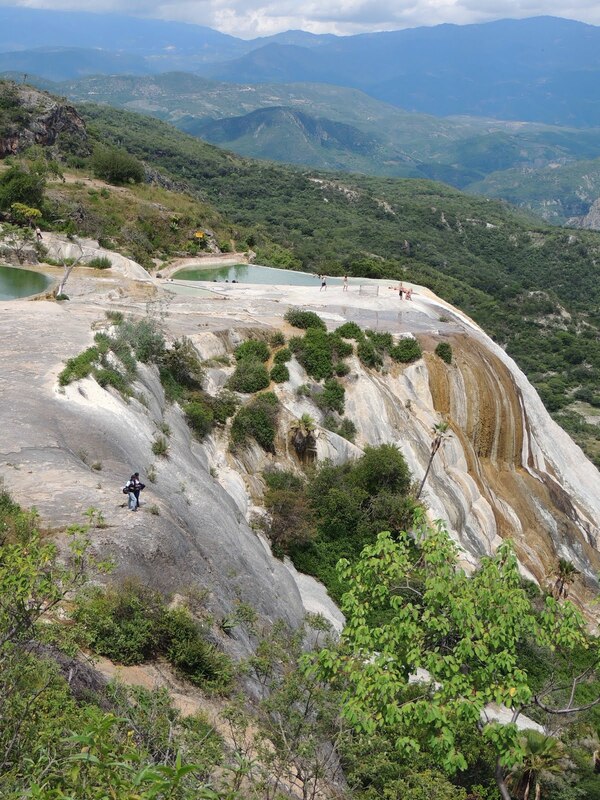 Atop of this are a series of small pools in which one can bathe just inches away from the drop. I could be enormously effusive about this place but the pictures do far more justice and even they fall short of what you actually experience being their amongst endless forests and hills. Check out the gallery.